The following article by Stan Stapleton, USGE National President, was published in the Ottawa Sun on Saturday October 17, 2015. 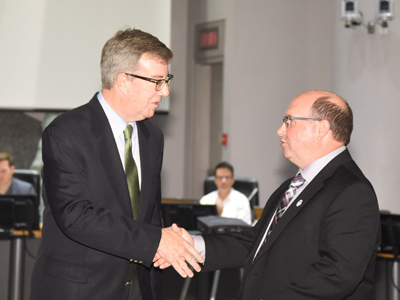 This morning, I stood with Mayor Jim Watson, Michael Allen, President and CEO of the United Way Ottawa, and Marco Pagani from the Community Foundation of Ottawa to make a fifteen thousand dollar contribution to Ottawa's 'United for Refugees' initiative. As President of the Union of Solicitor General Employees, a nationally based labour union with four thousand members in the nation's capital, it makes sense for us to help. Our community cares deeply about this issue. Two weeks ago, more than a thousand people showed up at the mayor's community forum to learn about sponsoring Syrian refugees. Every day, the news tells us about another boat load of desperate families, including young children, pregnant women, fathers, grandparents, fleeing from violence, war and poverty. Reports from the region speak of a brutal civil war with no end in sight. While it feels hopeless, making a donation seems like the right thing to do. But it's not a slam dunk. Like many Canadians, some USGE members may think we are spending resources on international causes far removed from their lives. Even if our contribution is equivalent to the price of a cup of coffee for each of our members. Others likely believe that with so many millions displaced, the small numbers of refugees we can help in Canada will make no meaningful difference. I expect that possibly a few members will call to tell me that USGE needs to 'stick to its knitting' and focus strictly on the challenges for our members, federal public servants who have faced difficult conditions in the past few years. Conditions including increased workloads, fewer resources, dramatic changes to legislation that affect how we do our jobs. As parole officers, detachment assistants, teachers, investigators and clerks who play key roles in Corrections, the RCMP, Justice, the Human Rights Commission and twelve other departments that focus on law enforcement, public safety and human rights, we've got our work cut out for us. A case in point. Several thousand of USGE's members work in dangerous, unpredictable conditions to apprehend, monitor, and rehabilitate federal offenders. With longer prison sentences, more gang violence and fewer programs to support offenders in transitioning back to the community, this is no easy task. Stress on the job is at an all-time high. Offenders often have little to lose once they come out of jail. But our members work with them day in and day out so that they have the chance to find a new path. And so that our communities are safe and secure. I would not be exaggerating to say that our plate is extremely full ensuring that our members are able to do their jobs well. But it's also exactly why we need to act beyond our own borders. The Syrian refugee crisis has brought home what it really means to live in communities that are safe and secure. And how easy it is to take that security for granted. And while Canada is by no means perfect, and there are still many communities where this security is precarious, it is what -as a society - we should all be striving for. Not just here in Canada. But globally. Millions of Syrian refugees are desperate to start over and re-build their lives. Many thousands more here in Canada are also in the process of rehabilitating theirs. And the Union of Solicitor General Employees is proud to do our part to give them the best shot at doing so.